Hello all, welcome to the Get Messy blog hop! Today the Creative Team is getting together and celebrating diversity in art! We will be giving away an annual membership through this blog hop. Read through my post to see how to participate. 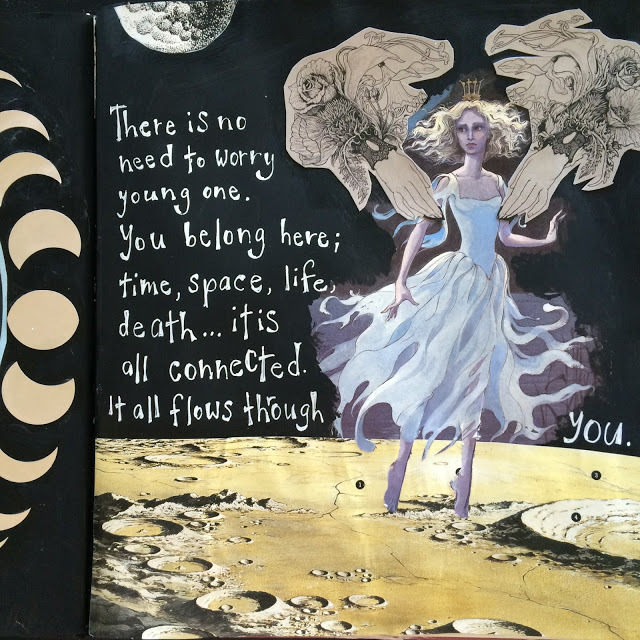 I wanted to share a few thoughts about using an altered book for art journaling. My go to art journal is a Moleskine Art Plus Sketchbook. I love the creamy pages and it holds watercolor pretty well, all things considered. But for the Season of Introspection, I used a children’s picture book that I altered. Because of the beautiful illustrations and the format of the book, my approach was quite different. I encourage you to interact with your book! Fold pages, cut them, alter them so that they really become yours. In this way the book not created by you really becomes altered and is turned into a new piece of art. Try to think of these pages as blank even though they are not. I wanted to share a couple of ideas with you when working in an altered book. First, take the time to look at what is on the page. Is there a visual element that you want to keep? Something that speaks to you? Then isolate it. It is ok to completely cover the pages with gesso, but if you are doing this throughout the whole book, then what is the point of using a book instead of a blank journal? On the page above, I isolated the image of Odette by using black gesso around her and gluing down a moonscape. This was very easy, I simply stuck a magazine page to my altered book using some packing tape. You could use washi tape or masking tape, even thread, to add a flap to your book. This is a very versatile technique. There are many ways to fold a page. Try to use all of the different parts of the page, as I did here. You may have to think things through beforehand so you figure out if the image has to be right side up or not. For this spread, I drew the central figure and then I cut out the rest of the page. By doing this, I keep the movement of the page itself. I drew the second figure afterwards. Try it, there is no limit to what you can do! And if you have more ideas, please let me know. Here is how you can enter the contest, just leave a comment on the blogs in the hop. The more blog comments you leave, the higher your chance of winning! The winner will be announced on Saturday the 23rd. Follow along the hop by going over to Torrie’s blog (Fox and Hazel) through Instagram here, or with the link below. I love how your book turned out!! So good. I love your folded pages! So awesome. I think I'm going to make a cheat sheet. Put down all the kinds of ways I can make marks, alter pages, put on color, etc etc. I forget what I have available to work with and what I can do when I approach a prompt! Thank you guys for this great blog hop! Ah! What a cool idea Meghan! Vanessa, ce n'est pas une révélation, tes pages me font souvent tourner la tête et grâce à toi, l'an dernier, j'ai pu participer à toutes les saisons de Get Messy, même si souvent je les fais "hors saison". Alors, voilà, je retente ma chance mais il paraît que la foudre ne retombe jamais au même endroit. Merci pour toutes ces fantastiques inspirations ! That is an awesome tutorial. Thanks for sharing! You always have the best ideas, V! When I have altered books & pages before, they've been primarily chapter books/novels. I haven't tried to alter a children's book, but I'm on the look out for a good book. I find what you mentioned about using parts of the book vs. covering the whole thing with gesso. I found I wasn't starting with gesso on every page. BUT I also find that using book pages is somehow less intimidating because there is already something on the page vs. a completely blank page. I think the more I make the less a blank page intimidates me though. Beautiful work & I can't wait to do more altering of the pages by folding and cutting and adding flaps! Very thought provoking journal page. Good imagery. Your pages are so magical! It's like a tale in the tale. Thank you for the tutorial and your art! I'm a mental health practitioner and I run my own business. I'm about to launch some youth art journalling workshops and would love to win the Get Messy membership so I can share the wealth of information with my clients! Hi! Congratulations! Youre our winner! If you will email Lauren at Lauren@getmessyartjournal.com I will get you all set up with your membership! J'avais découvert ton blog, grâce à Sophieb26 d'Instagram. Wonderful pages and ideas ! Thanks for the inspiration! I love your moonscape! Thank you for showing us how to add some dimension to our art journals! I've said it before and I'll say it again – I love the way you use your pages to their full potential – and the flaps are inspired. I love all the tips and little videos. Thank you for the inspiration and this fun blog hop! Your pages are gorgeous! I love how you use the page to inspire your art journaling! Not all of the images are showing up here. But I love what I see soar. I love the folded pages, and I think your ideas will work even in a journal that is not an altered book, as well – so creative! I tried altering a book when I was quite young but never got past the first page. I'll have to give it another go! That folded page is like a rubics cube! Im SO amazed! I think this art journal is one of my favorites! So rich and profound. I love how you've altered the book and made it your own! I once tried altering a book of poetry, but all the words were so lovely, I didn't want to cover them up. Now, I am inspired to revisit the idea with your tips in mind. Thanks for sharing!